← Eric Nam in LA: Ticket Giveaway! Dramafever Swag Bag Giveaway: Winners!! Thank you to everyone who entered our special 3rd Annual Dramafever Swag Bag Giveaway! We are happy to announce our winners! Yes…winners plural because we had so many great entries, we couldn’t just pick one! Now, having said that, there is still only one GRAND prize winner, who receives the swag bag, but for the two runner-ups, we will be sending you something as well! OK! Without further ado…your winners…. 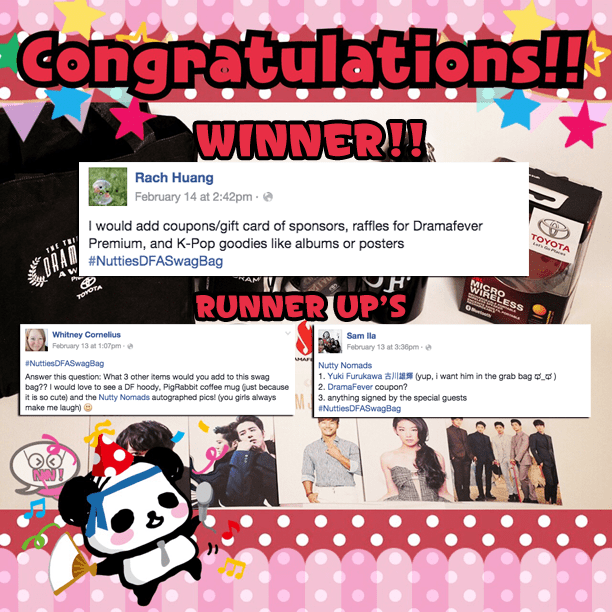 Swag Bag Winner: Rach Huang! Runner Up’s: Whitney Cornelius and Sam Ila!